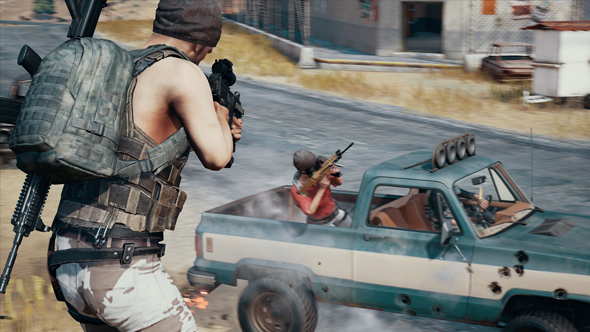 Brendan Greene, the creator of PlayerUnknown’s Battlegrounds, would like to see greater legal protections for the systems game developers create. Speaking to us in a new interview, he explained he doesn’t want to copyright the whole Battle Royale genre but there are systems he created which are simply being lifted in other games. In other PUBG news, here’s everything we know about PlayerUnknown’s Battlegrounds new maps. Before PUBG, Greene had played around with the Battle Royale systems in an Arma 3 mod and a mode for H1Z1. “Battle Royale and H1Z1 were my concoctions as well, and even the battle royale game mode I licensed to H1Z1 and I licensed to Bluehole,” Greene explains. For instance, in neither of those series do the characters parachute into the island or have artillery strikes fall on red zones (though, they do both feature areas that are locked down with player-killing environments). Greene and Bluehole’s vice president C.H. Kim have been talking about a need to legally protect creators who create new systems, like those in PUBG.